Chester FC will attempt to assist with any press and media requests received. 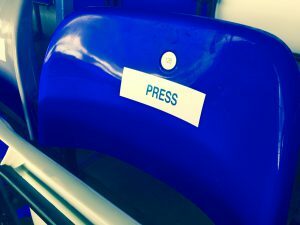 Please email Media and Public Relations Officer Albert Davies (albert.davies@chesterfc.com) at least 48 hours before the scheduled kick off time if you would like to reserve a Press or Photographer Pass for matches at the Swansway Chester Stadium. Please include contact details to enable us to confirm if your request for a Press Pass has been validated. If you are interested in filming on match days please advise us of this at least 7 days prior to match days to enable us to accommodate your request, otherwise this may not be possible to approve for match day filming. A Risk Assessment may be required depending on the level of filming. Photographers should note that if looking to go pitch side, then full insurances must be in place prior to admission. Requests for any media interviews should be sent via email to media@chesterfc.com or by telephone on 01244 371376.